In October 2012 Hurricane Sandy moved through the Caribbean and along the Atlantic coast of North America, causing extensive damage to coastal communities from Cuba to Canada. Economic losses in the United States—estimated at $71.4 billion—were most severe in the New York metropolitan area, with its high concentration of vulnerable residences, globally significant businesses, and critical infrastructure (U.S. Dept. of Commerce 2013:25). One lesson experts and officials drew from Sandy was that it would not be enough to simply repair damage; it was imperative to rebuild with an eye to a climate-changed future. A little more than a month after Sandy’s landfall, Michael Bloomberg, then mayor of New York City, proclaimed, “We can’t just rebuild to what was there and hope for the best.” The “biggest challenge the city faced” was adapting “to risks associated with climate change.” Meeting that challenge would require “a leap into the future” (Bloomberg 2012). President Barack Obama’s Executive Order of December 7, 2012, which established a Hurricane Sandy Rebuilding Task Force, framed the problem in similar terms. “The region’s aged infrastructure”—including “its public housing, transportation systems, and utilities”—had to be upgraded to a “more resilient condition given both current and future risks” (Federal Register 74341). Among the Task Force’s major recommendations was to create a “multi-stage regional design competition to promote resilience for the Sandy-affected region” called Rebuild by Design (RBD) (Task Force 2013:1). The U.S. Department of Housing and Urban Development (HUD), which oversaw the competition, described two goals for RBD. First, it would solicit innovative proposals for “regionally scalable but locally contextual solutions that increase resilience in the region” (Task Force 2013:1). Second, it would implement winning projects using funds from HUD’s Community Development Block Grant program. What did the Task Force mean by framing post-Sandy reconstruction as a problem of design? Most obviously, it referred to the consensus among after-action and recovery reports that it was imperative not just to reconstruct what had been destroyed, but to rebuild with an eye toward a climate-changed future. But more than this, design referred to a particular approach to organizing experts and publics in planning for complex, large-scale infrastructural projects. The contours of this design-based approach were laid out in HUD’s competition brief, which outlined requirements for project teams (Task Force 2013:3–7). The brief is notable both for what its instructions include and for what it omits. It provided no guidance on which parts of the New York metropolitan region or which specific vulnerabilities competition entries should address, noting only that projects should focus on dense urban areas with “highly complex built and human systems and significant economic value for the entire region,” and should also “provide collateral benefits for communities” (Task Force 2013:11). Nor did the brief dictate the approach that competition entrants should take. Proposals were expected to range “from large-scale urban and multi-functional green infrastructure to small-scale distributed flood protection measures and resilient residential structures” (Task Force 2013:1–2). The HUD brief did, however, provide elaborate detail about the process through which proposals should be formulated. Project teams were required to include experts from a wide range of areas, including infrastructure engineering, landscape design, urban design, architecture, industrial design, community engagement, and communications design, among many others. The brief also directed project teams to “set new standards” for participation through an iterative process of public engagement, underscoring that particular attention should be paid to the inclusion of “underserved populations” (Task Force 2013:3–9). Both RBD organizers and design teams saw the introduction of design thinking to disaster recovery and infrastructure planning as an exciting departure from past practice. Henk Ovink, the Dutch water planner who conceived RBD, proclaimed that the competition set “a new standard of regional resilience in design and development, in building and rebuilding” and presented “a way to answer climate change, sea-level rise and future economic, ecological, and cultural demands” (Dutch Water Sector 2014). Matthijs Bouw, a lead designer on one project team, saw RBD as a “new type of project,” given its emphasis on community engagement and the central role of designers in infrastructure planning, which had “historically been the domain of engineers.” “Everyone feels that this is the way of working in the future,” he enthused. “[W]e can bring a certain level of urbanism, excitement, aesthetics…community buy-in, [and] intelligence” (Lau 2015). This insistence on RBD’s novelty may seem puzzling given ubiquitous contemporary demands for participation and interdisciplinary collaboration. It is easier to understand when we consider how experts and publics have traditionally been organized in U.S. infrastructure projects in general and specifically in planning flood protections. Since the nineteenth century, U.S. government investment in flood control projects such as dams, levees, and flood walls has been justified by arguments about market failure and public goods: since private markets “underprovide” flood protection, public investment is justified as a means to maximize collective welfare. Technical experts calculated economic benefits and costs of these projects, and were authorized on this basis to act on behalf of a passive public. These figures of the all-powerful expert and the passive public are not absent in RBD. But there is a second public suggested in the RBD brief: an active public that participates in the design process through task force meetings, town halls, public comment periods, and workshops. We also find a different formation of expertise. Economists and engineers, who previously occupied a uniquely privileged position in infrastructure planning, no longer work in enclosures of administrative authority in which only facts, rather than struggles over values and interests, are considered. Without taking the description of the RBD brief for granted—or being swept up in the enthusiasm of designers—it is worth probing further into this new ecology of experts and publics. On June 2, 2014, the “BIG U” was announced as one of six RBD winners. BIG referred to the Bjarke Ingels Group, the architecture, urban planning, and design firm that led the project’s development. The “U” referred to a 10-mile flood protection system that wraps around the lower part of Manhattan (Figure 1). BIG’s final proposal addressed RBD’s directive that projects should focus on high-density urban areas that are both vulnerable and vital for a broader region, noting that the project area is “at the core of an economy with a $500 billion annual GDP” (BIG Team 2014:8). 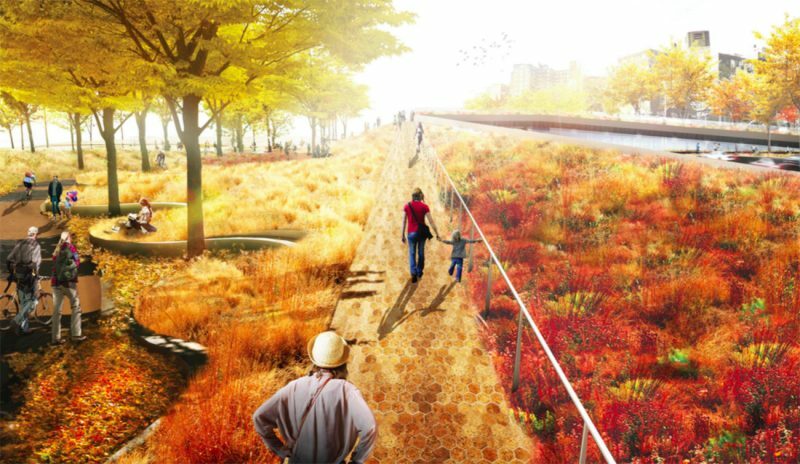 The proposal also addressed the RBD directive to establish new standards of participatory design for infrastructure projects and “provide collateral benefits for communities” (Task Force 2013:11). The BIG U, designers argued, would “shield the city against floods and stormwater,” provide “social and environmental benefits to the community,” and “inject new urban life forms into our cities” (BIG Team 2014:7–8). Figure 1: The BIG U. 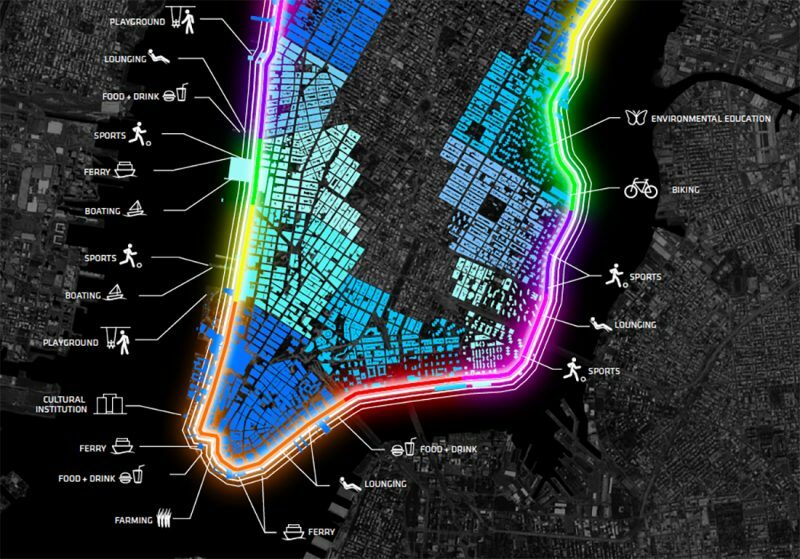 In developing its final proposals, the BIG team created separate but coordinated plans for three segments of the waterfront and adjacent communities, called “compartments.” Each compartment comprised “a physically separate flood-protection zone” in which proposed interventions had a “benefit-cost ratio greater than one” (BIG Team 2014:8).This benefit-cost ratio was assessed using a standard methodology: flood models were used to predict each compartment’s likelihood of flooding and the damage that flooding would cause; estimates of the damage that would be averted by proposed protective measures—the project’s benefits—were then weighed against costs (BIG Team 2014:211). Here we have a familiar story: engineers and economists make technical calculations about benefits and costs that a passive public will bear. But this was not the whole picture. Each compartment was also approached as “a field for integrated social and community planning.” Compartment-level plans would be “designed in close consultation with the associated communities and the many local, municipal, state and federal stakeholders” (BIG Team 2014:8). 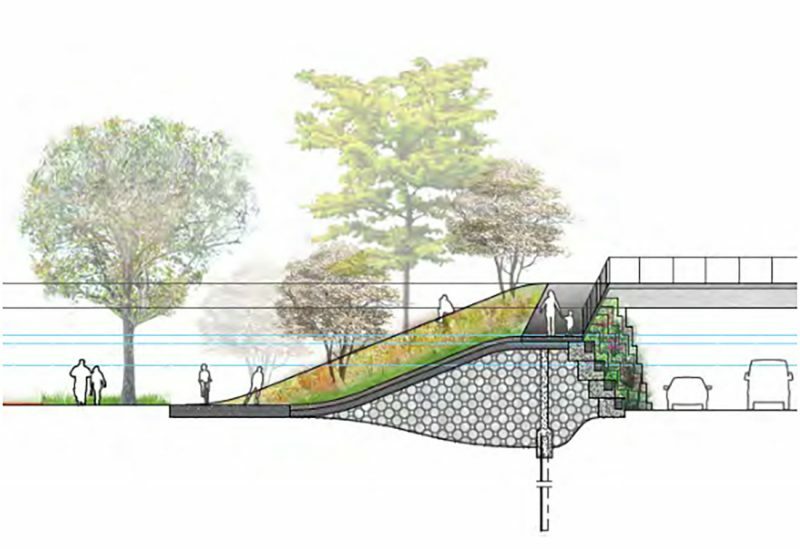 In this sense, the compartment was also scaled to the second kind of public described in the RBD brief: a more local public actively engaged in and mobilized around matters of common concern. Figure 2: The ESCR area running along the East River in Manhattan, from Montgomery Street in the South to East 23rd Street in the north. 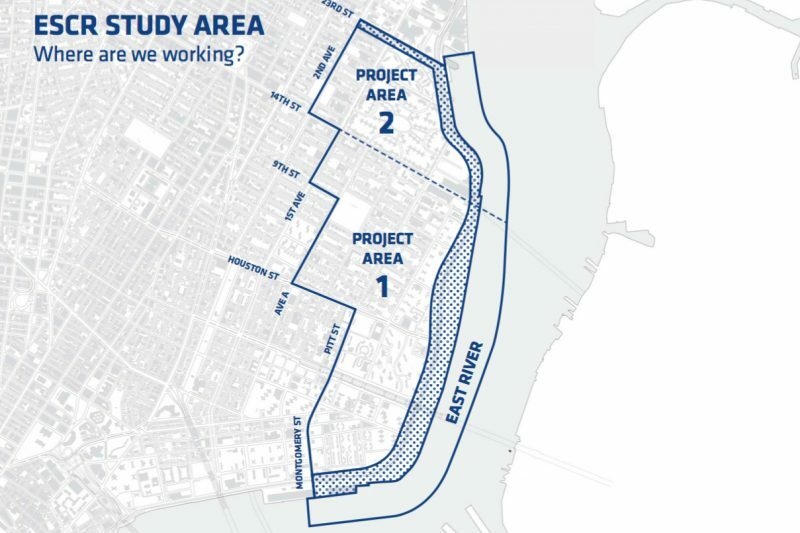 The first compartment of the BIG U to be funded was a segment extending along the East River from East 23rd Street to Montgomery Street (Figure 2). Dubbed the “East Side Coastal Resiliency Project” (ESCR), the plans for this area included a complex of infrastructural works that simultaneously provided coastal protection and amenities to surrounding communities. 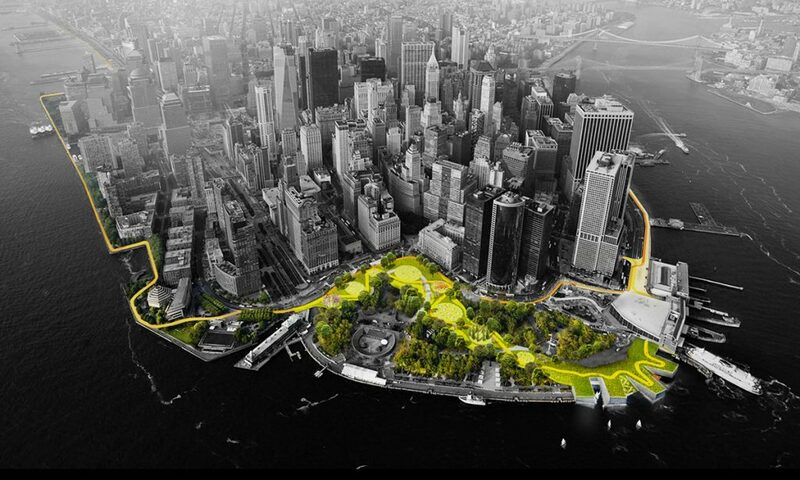 A “Bridging Berm” (Figures 3 and 4) running along the East River Park would provide “robust vertical protection…from future storm surge and rising sea levels” while offering “pleasant, accessible routes into the park” and opportunities for “resting, socializing, and enjoying views of the park and river.” Further south, deployable flood walls would be flipped up in good weather as “an inviting ceiling above the East River Esplanade” and flipped down during winter to create space for “a seasonal market” (BIG Team 2014:122, 144). Figure 3: The Bridging Berm. The diagram shows the flood level of Hurricane Sandy (bottom blue line) and the FEMA 100 year flood plain projection for 2050 (middle blue line). The selection of the ESCR as the first compartment to be built was interesting and in some ways surprising. The area protected by the ESCR is hardly an exclusive enclave of the rich. As the BIG team noted, the neighborhood is economically (and otherwise) diverse, with a significant number of low-income households (median incomes are $41,640 versus $73,145 for Manhattan as a whole (The Furman Center 2014:109–112)). The area also has a long history of mobilization and resistance to development efforts. In the 1950s, local activists successfully opposed redevelopment plans in the Cooper Square area. One spinoff from this organized opposition evolved into Good Old Lower East Side (GOLES), a tenants’ rights group that continued to resist what its members saw as a succession of city-imposed development plans (Angotti 2010). When the city unveiled a plan to “dramatically redevelop” the East River waterfront in 2005, GOLES and other neighborhood organizations charged that the project had “the potential to exacerbate gentrification” and was “not responsive to the needs of the surrounding community” (O.U.R. Coalition 2009:2). A coalition of local groups issued a counter-proposal, “A People’s Plan for the East River Waterfront,” that called for a “community-centered” development scheme, and ultimately forced the city to abandon its efforts (Rice 2009). Figure 4: A rendering of unprogrammed public space on the Bridging Berm. After Hurricane Sandy inundated many neighborhoods along the East River and knocked out essential services, GOLES and other local organizations mobilized around disaster preparedness. This mobilization was fueled by residents’ new awareness of their vulnerability to flooding, as well as their sense of abandonment in the wake of the storm. On some accounts, critical city agencies were virtually absent after Hurricane Sandy, leaving residents with the impression that they were being “left for dead” (Buckley and Wilson 2012). As Michael Callaghan, executive director of Nazareth Housing, recalled, “We realized…that we didn’t have strong community skills or capacity because we had no power, and needed to figure out how to do this stuff together” (personal interview, 1 March 2016). Callaghan and GOLES executive director Damaris Reyes created an umbrella emergency preparedness organization called LES Ready! that united more than 25 local groups, organized around ethnic identity (Hispanic, Chinese, and Ukrainian groups were included) and a range of specific issues (services for elderly, homeless, and disabled residents; legal and social services; public housing and rent control, etc.). LES Ready! was well established by the time BIG began its work. For BIG’s designers, according to project leader Jeremy Siegel, the group was a “pre-packaged community” that could be enlisted in participation (personal interview, 19 March 2015). Meanwhile, the highly mobilized members of this “pre-packaged community” were initially skeptical about working with RBD’s designers. Callaghan recalled concerns “that people were going to come in and do this project and there wasn’t going to be any community input” (personal interview, 1 March 2016). Lilah Mejia, disaster preparedness coordinator for LES Ready!, recounted that “when they approached us on the idea, we were all taken aback. We were like, ‘Is this a good idea, a bad idea’ just for the simple fact that…we have all these developers coming in, taking over, changing the landscape, and we weren’t sure if they were one of them as well” (personal interview, 7 November 2015). At one community meeting, a local resident worried that RBD’s proposals were “just another way for the city to increase rent and kick out the poor” (Office of Recovery and Resiliency 2015). So how did the design process actually play out? And how was it viewed by activists and organizers who had long been mobilizing against development plans in the area? First, though local activists remained vigilant about gentrification, they came to believe that RBD was not simply a front for luxury development. “Even though we fight developers,” said LES Ready! co-chair Damaris Reyes, “[Rebuild by Design] wasn’t necessarily about housing. It wasn’t so direct in terms of, ‘We’re building luxury apartments,’…. [W]e felt that at the very least…the intentions were not to get rid of us” (personal interview, 27 March 2016). Indeed, private development was never one of ESCR’s significant goals. Rather, it was social exclusion and the unlikelihood of private investment that created a case for prioritizing government intervention in the Lower East Side. According to BIG designer Jeremy Siegel, public officials felt that the LES was “sort of a population and a building stock which…was particularly appropriate for public funding given that there aren’t a lot of development opportunities” (personal interview, 7 January 2016). Local activists also reported that they were closely involved with—and satisfied by—the process of “community engagement.” The organizations in the LES Ready! coalition were intimately involved in planning “community workshops”—both during the competition and following BIG’s selection as a competition winner—successfully pushing for changes in location and format that would make them more accessible to a wide range of residents. GOLES staff member James Rodriguez also reported to us that LES Ready! had “control of outreach,” a fact that may be attributable both to RBD’s mandates for participation and to local groups’ mobilization and close relationships with local residents (personal interview, 24 March 2016). The public meetings themselves used familiar design strategies to elicit feedback and interaction. The design team used “interactive models to demonstrate potential flood protection options and generate discussion” (BIG Team 2014:75). Attendees completed surveys about the proposal and placed colorful stickers on maps of the neighborhood where they wanted increased park access, safety measures, and green space. Local organizers reported that this input was taken seriously into account. Lilah Mejia of LES Ready! told us that “once [BIG] had these meetings, they kind of came back and showed the final idea. And they also had these miniatures to help explain the idea of the design…. It kind of gave ownership to the people who were there” (personal interview, 7 November 2015). LES Ready! co-chair Damaris Reyes—who had recently spearheaded resistance to city development plans—painted a similar picture. “The only reason that our support has remained,” she insisted, was “because I have felt that I’ve seen the input of my community reflected in these designs. If I hadn’t seen that, I promise you we would have fought tooth and nail to keep this project from becoming a reality” (personal interview, 27 March 2016). Still, suspicions lingered, and some participants left meetings unsatisfied. After a town hall forum in which city officials spoke for nearly an hour and left little time for public comment, one man charged that the city was paying “lip service” to participation. Others found that questions beyond amenities and local quality of life were pushed to the side (Office of Recovery and Resiliency 2015). At one public meeting, an attendee who raised broader issues about the overall scope of the project was instructed to relay them on a comment card rather than engaged in public discussion (Office of Recovery and Resiliency 2015). Indeed, we might ask whether “design” in this case was simply a way to secure community acquiescence while officials and experts retained their old control of the important aspects of the project, which concerned not local amenities but large-scale questions of structural protection and the allocation of hundreds of millions of government dollars. But it is worth at least pausing before jumping to such conclusions. This is, after all, a “community” that has been continuously mobilized to address urban development issues for half a century. It is certainly noteworthy that the leaders of local organizations—who are hardly political naifs—see RBD as a significant break from a long history of top-down development projects in which they never had a meaningful voice. At the same time, we should not be too quick to assume that the truly important aspects of the project were only those issues about structural protection and economic benefits that were not part of the participatory process. It is notable that in public comment periods, residents’ highest priorities were local amenities and the integrity of the participatory process itself. Indeed, design-based interventions like RBD challenge us to think about participation not merely as a means to an end—a way for particular interests to lay claim on particular resources—but as a highly meaningful outcome of planning. This sentiment was echoed in many of our interviews, even with local leaders who remain skeptical about the prospects of the BIG U. LES Ready! co-chair Michael Callaghan, who continues to harbor doubts that the project will be implemented as currently envisioned, observed that “RBD helped give us a focus, not just in responding to disaster and getting over that, but thinking critically together” (personal interview, 1 March 2016). The value of infrastructure here is realized not just in the protections it affords, or the amenities it supports, but in the very organization of a collective process: the (self-) constitution of an (active) public to address the planning and construction of common things. Angotti, Tom. 2010. New York for Sale. Cambridge, MA: MIT Press. BIG Team. 2014. “The BIG ‘U’: Promoting Resilience Post-Sandy Through Innovative Planning, Design and Programming.” Rebuild by Design. Available at link. Bloomberg, Michael. 2012. “Mayor Bloomberg Delivers Address on Shaping New York City’s Future after Hurricane Sandy.” December 6. Available at link. Buckley, Cara, and Michael Wilson. 2012. “In New York’s Public Housing, Fear Creeps in with the Dark.” The New York Times, November 2. Dutch Water Sector. 2014. “HUD chief Donovan announces winners of NJ Sandy Rebuild by Design competition.” June 3. Available at link. Federal Register. 2012. “Establishing the Hurricane Sandy Rebuilding Task Force.” Federal Register 77:74341–74344. The Furman Center. 2014. State of New York City’s Housing & Neighborhoods–2014 Report. Available at link. Hurricane Sandy Rebuilding Task Force (Task Force). 2013. Promoting Resilience Post-Sandy Through Innovative Planning and Design. Available at link. Lau, Wanda. 2015. “Q+A: BIG and One Architecture on Making the Dryline a Reality.” Architect Magazine. Available at link. O.U.R. Coalition. 2009. “A People’s Plan for the East River Waterfront.” Available at link. Rice, Traven. 2009. “Velazquez, Community Groups Press City to Revise Waterfront Plan.” The Lo-Down, October 19. Available at link. U.S. Department of Commerce. 2013. Economic Impact of Hurricane Sandy: Potential Economic Activity Lost and Gained in New Jersey and New York. Available at link.